It is the nature of men to create monsters, says virtual counter-hero Harlan Wade of F.E.A.R., and it is the nature of monsters to destroy their makers. Mary Shelley and the Golem come to mind, but what happened in Benghazi on Tuesday is more reminiscent of Bram Stoker. U.S. 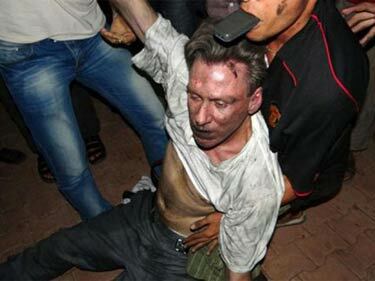 Ambassador to Libya Christopher Stevens did not create it, but he was directly involved in helping unleash the dormant monster which destroyed him. His death is the paradigm for the U.S. policy vis-à-vis the world of Islam since 9-11. “In the early days of the Libyan revolution, I asked Chris to be our envoy to the rebel opposition,” Hillary Clinton said in her eulogy. “He arrived on a cargo ship in the port of Benghazi and began building our relationships with Libya’s revolutionaries.” As an American liaison to insurgents who had just started to fight Qadafy’s forces, Stevens was instrumental in turning a local revolt into a fully-fledged rebellion. As ABC News notes, he was “literally on the rebels’ side while the revolution was at its most vulnerable.” Introducing himself as ambassador in a State Department video four months ago, Stevens said that he “was thrilled to watch the Libyan people stand up and demand their rights” during the uprising. Not a word of reproach for the rioting mob inside the gates. Condemnation was reserved solely for the makers of an obscure and poorly produced video allegedly insulting the prophet of Islam, Muhammad. Available on Youtube for months, it merely provided an excuse to perpetuate the attack on the Embassy. It is striking that in both cases an apologetic condemnation of the video came first, thus implying that the mob had a valid cause to be enraged. CSM editorialist asserts that Muslims fear blasphemy, without explaining what Muslims mean by that word. Their definition of “blasphemy” is any irreverent behavior toward persons, objects, rites, and beliefs that Muslims revere. To put it succinctly, being non-Sharia compliant is blasphemous. Not accepting the divine origin of the Quran is blasphemous. Applying the standards of natural morality to Muhammad’s illustrious career is blasphemous. Resisting the imposition of Sharia is blasphemous. In the end, being a non-Muslim is blasphemous. The expectation that “enough peace-loving Muslims” will stand up “for an interpretation of Islam that sees freedom as necessary for the flourishing of faith” is absurd. Orthodox, mainstream Islam demands total, abject submission to the word of Allah and to the example of his prophet. Such submission is the only true freedom in the world of Ummah. Any other “interpretation of Islam” is heresy and disbelief. But willful self-deception continues. A stream of Western media calls on “peace-loving Muslims” to stand up to their murderous coreligionists started right after 9-11, and it will continue even if Manhattan is vaporized in a mushroom cloud. In the video made to introduce himself to Libyans shortly before he took up his post as ambassador last spring, Christopher Stevens said he was looking forward to his assignment “as we work together to build a free, democratic, prosperous Libya.” As a fluent Arabic speaker with two previous tours of duty in Libya, if he believed what he said, he was an imprudent man. The Arab Spring has shown its true face, as we have known all along that it would. The monster is unleashed. Every person in our foreign policy-making establishment is responsible for the bloodshed in Benghazi, not least the victims themselves.